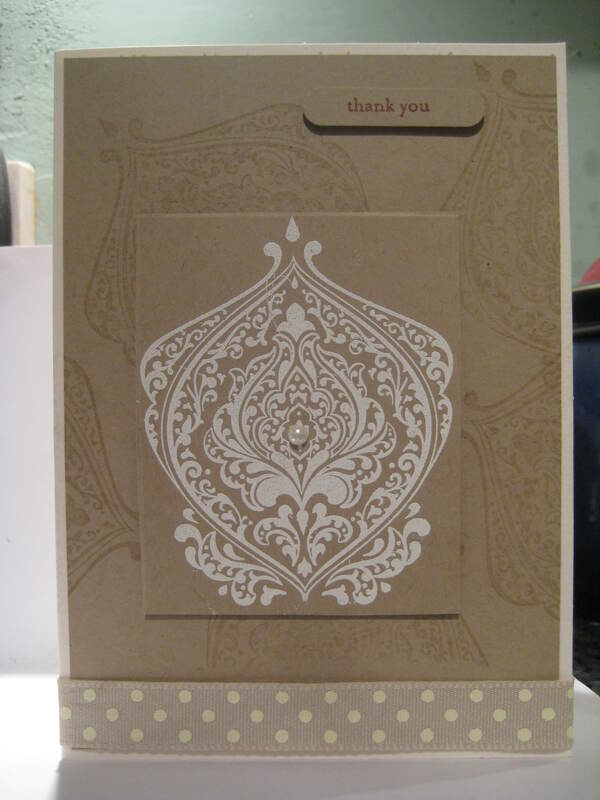 One of the first Stampin Up stamps I bought was Beautifully Baroque and I love it, but have not used it for a while. I was doing something completely mundane, like housework, and I suddenly felt inspired. I put down my duster (well, any excuse) and got out my cardstock. On to a base of Crumb Cake, which I think is a lovely colour, I stamped the Beautifully Baroque stamp randomly with versamark ink to make a watermark effect. Then, heatgun at the ready and again using versamark, I stamped the image on another piece of Crumb Cake but this time I also used a white embossing powder. A piece of ribbon along the bottom, a pearl in the middle of the design and “Thank You” stamped and punched using the word window and ta da! I love muted pallets and this certainly fits the bill. Sentiment from the Teeny Tiny Sentiments Set. Pearl from the basic pearls pack.